There are two things I need to make my work days run smoothly – a lunch that I can quickly pack in the morning and a lunch that I can quickly eat during my 25 minute lunch break. 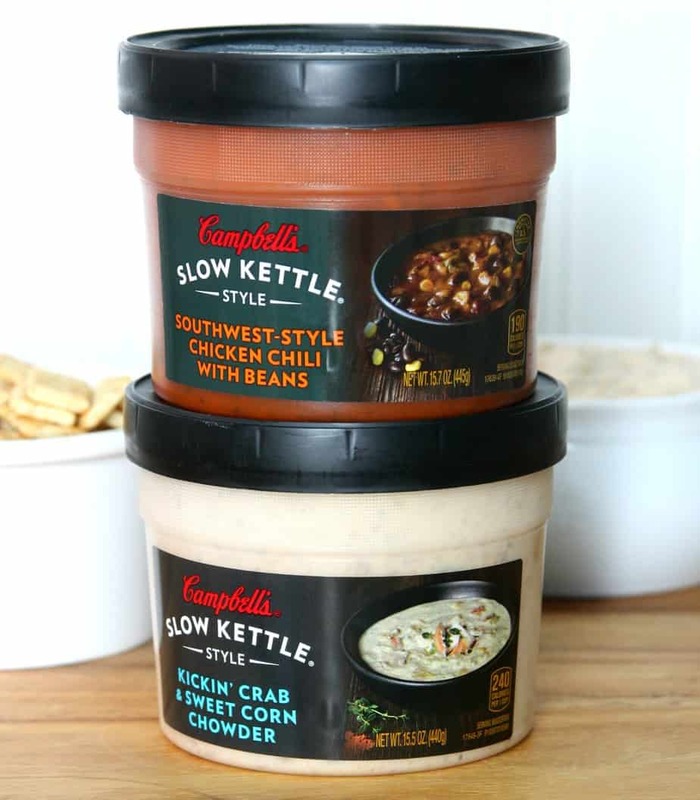 So I was super excited to discover Campbell’s Slow Kettle Soups while grocery shopping last week. Walmart had a nice selection of the Slow Kettle Soups so I picked up a few to try. They are available in 13 flavor combinations which means there are a lot to choose from. I’ve always been a huge fan of taking soup to work for lunch because it is so easy but now it has gotten even better. Now I don’t even need a bowl or a container with a lid. Campbell’s Slow Kettle Soup can be prepared right in the container. Just microwave on high for 2 minutes and your lunch is ready. It doesn’t get any easier than this! These hearty soups really do make the perfect lunch! They are delicious and full of flavor. 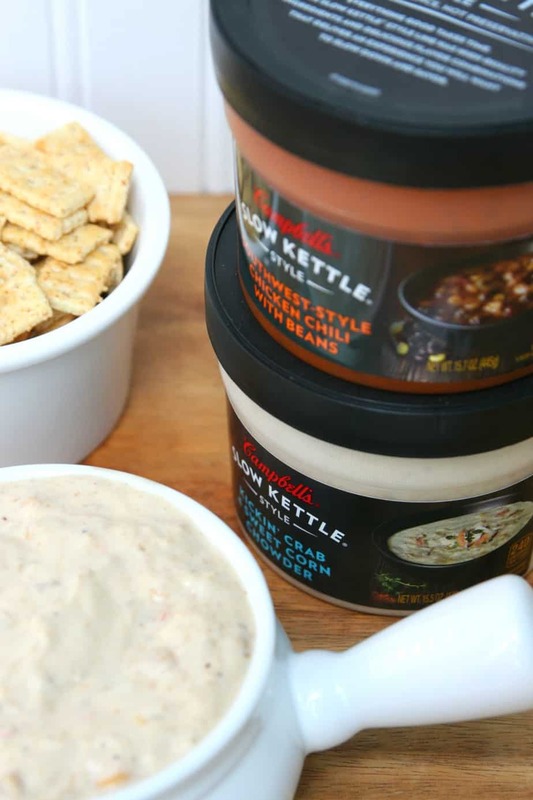 I especially love that I’m no longer hungry an hour after eating my lunch when I eat Campbell’s Slow Kettle Soup. 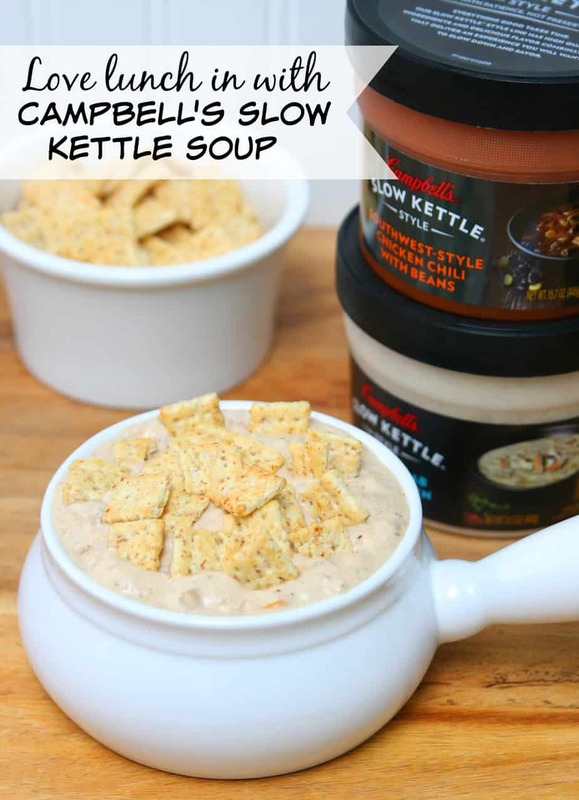 Have you tried Campbell’s Slow Kettle Soup? Which flavor is your favorite? Want to love your lunch even more? 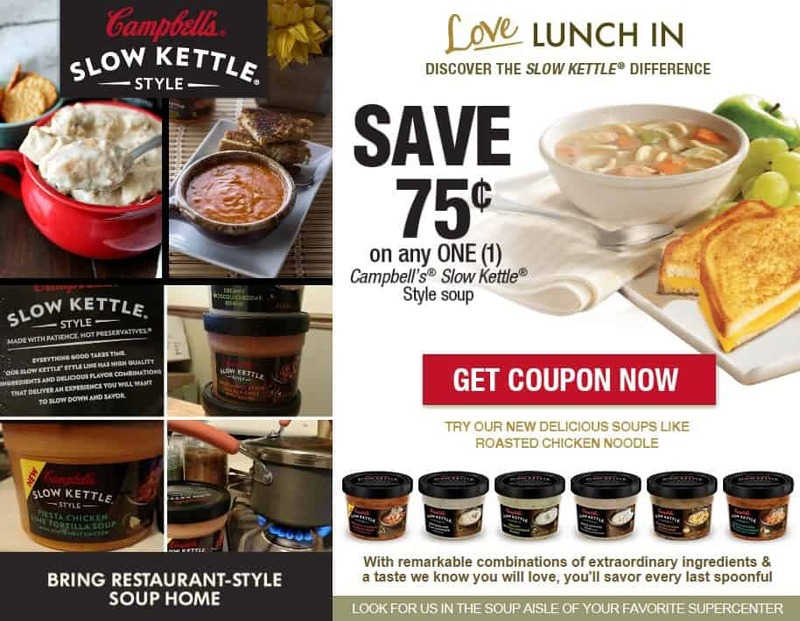 Print out the coupon and pick up a few containers of Campbell’s Slow Kettle Soup the next time you’re grocery shopping. 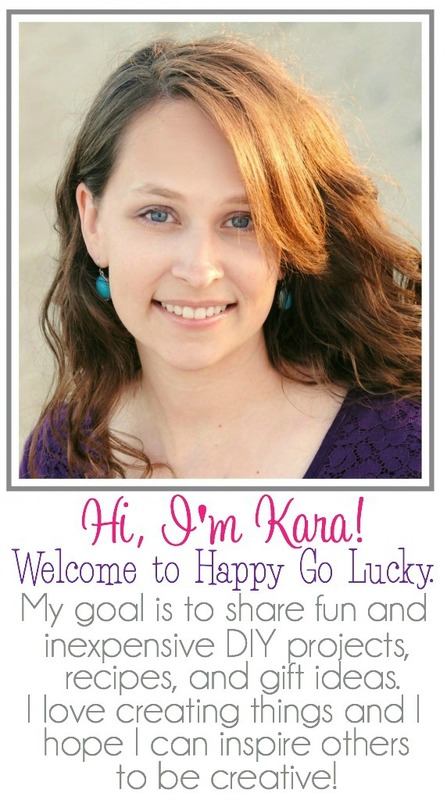 I also thought it would be fun to share 10 Ways to Relax During your Lunch Break. I’m mostly sharing this as a reminder to myself! I really need to start taking 10 minutes at lunch to relax and not focus on work. 2. Give yourself a mini spa treatment – message your hands and arms with lotion. Apply cuticle cream to your nails. You can even apply message oil to your temples. 3. Go outside – Eat your lunch outside and/or go for a walk. 6. Step away from your desk – Stop doing work. I also think it helps to eat lunch away from your desk so you can stop focusing on work stuff. 7. Talk to co-workers – Sometimes I just need to have an adult conversation during my lunch half hour:) It’s my only break during the day where I can actually talk to other adults. 8. Email or text someone. Catching up with friends is the perfect way to relax for 10 minutes. My husband and I also text each other often during lunch. It’s the perfect way to take my mind off of work.